My journey into this Chinese garden began when I pushed the doorbell of the modern duplex home with the small “hut” in the front yard. 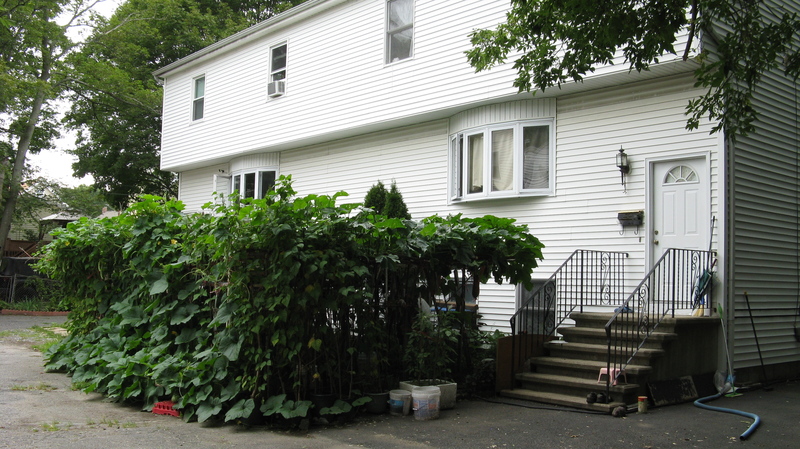 Many times I have been intrigued as I have walked by structures that appear to be huts from another time, another place, completely covered in climbing vines with hanging fruit that I have never seen, in the front yards of modern day homes. Maggie is a very warm, generous woman. In an afternoon she introduced me to the family food garden. Later, I met her mother, Yan, who greeted me in the hot sun holding an umbrella with a beaming, open hearted smile. We communicated in smiles. Yan is the gardener and Maggie spends summers from college working together with her. They are from Canton, southeast China and have lived in Malden since 1998. Maggie showed me the backyard where every bit of land is used in this lush, beautiful garden that feeds more than 15 family members and friends. 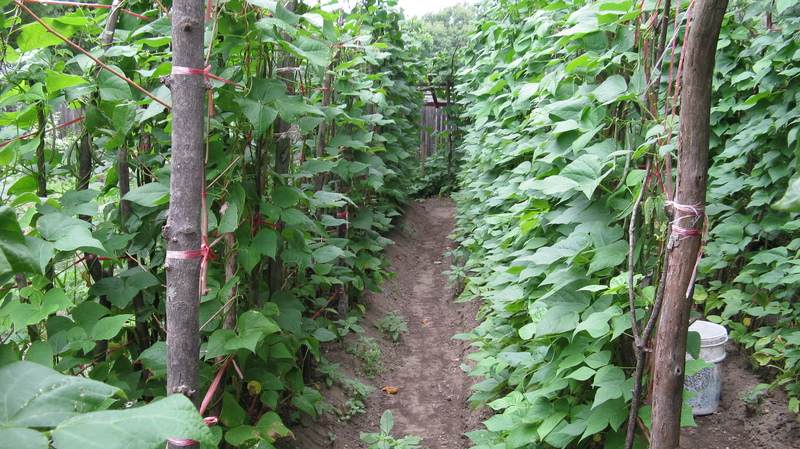 Six-foot tree branches hold up long rows of beans of different colors alongside unknown crops of plants of all shapes and shades of green. She taught me the name of each plant and how it was used in cooking and in Chinese medicine and showed me her samples of lichee, longan and other fruit trees. Large leaf Chinese pumpkin crawl along the earth. Rows of herbs like “zi si,” spiky garlic chives and others growing under familiar peach and cherry trees. She described how her mother constructed the hut in the front yard. I learned that the placement of this Chinese vegetable garden is based on the location of the sun unlike our culture that reserves the front yard as a showpiece and banishes the vegetable garden to the backyard, hidden, unseen. Yan uses many different materials to complete her structure that stands about 6’ high. It is mostly made from tree branches and wood strips. 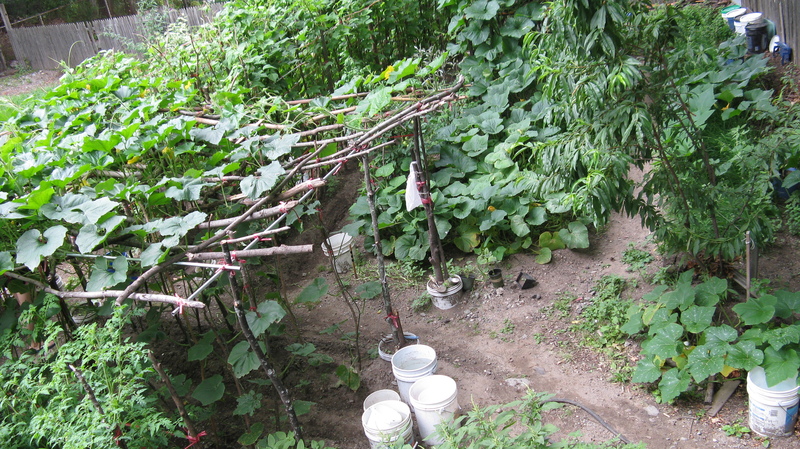 Yan’s husband, Ying pounds the six foot branches into the ground about 10” apart to form walls. Horizontal braces are added, then lastly a roof of sticks. 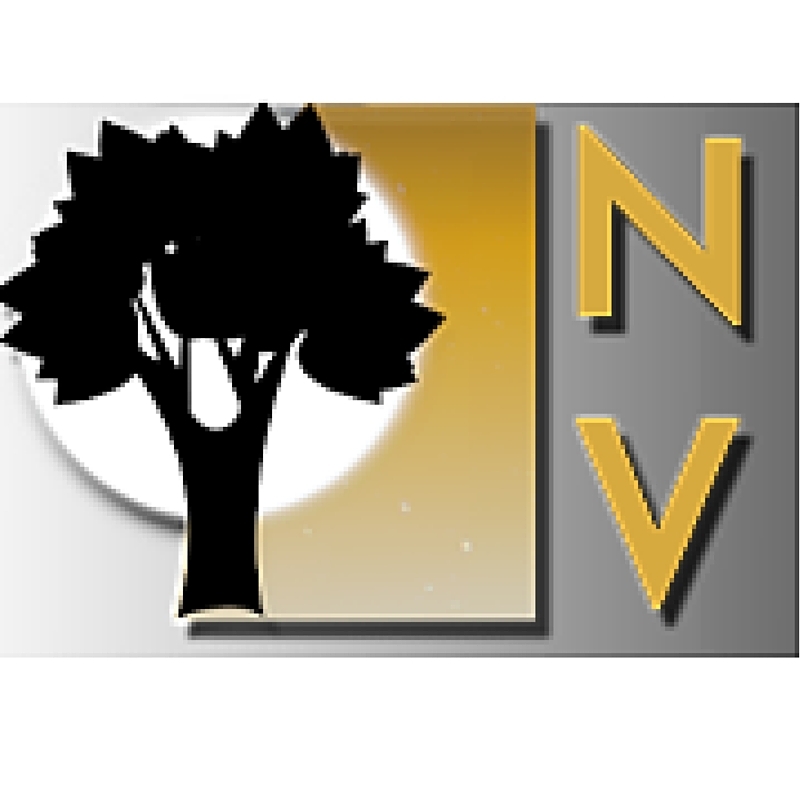 Many other materials have been gleaned from the environment and recycled along with tree branches like broomsticks, metal piping, curtain rods, wood strips, and tubing. Every juncture is hand tied with twine to hold it together. The use of sticks, branches, and string is reminiscent of earlier Italian immigrants who used them to stake tomato plants, climbing beans and to hold grapevines overhead. During the winter the stick roof prevents snow from falling to the ground to allow for composting the soil below all winter with soybeans, shrimp shells, eggshells and vegetable peelings. 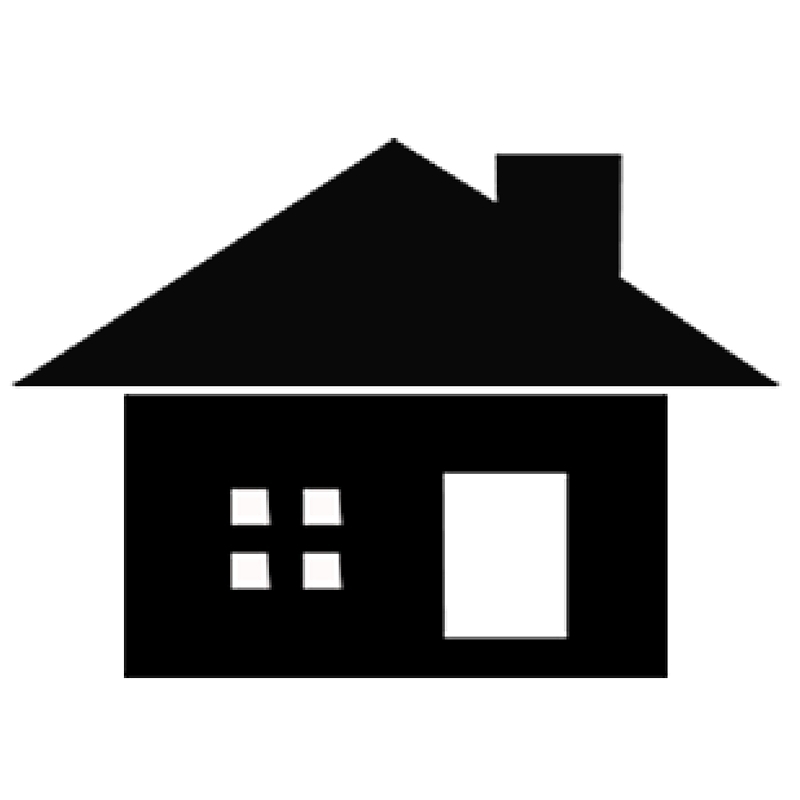 When the earth begins to soften the structure is torn down, shifted, and rebuilt so the crops can be rotated. In April, Yan plants seeds indoors. 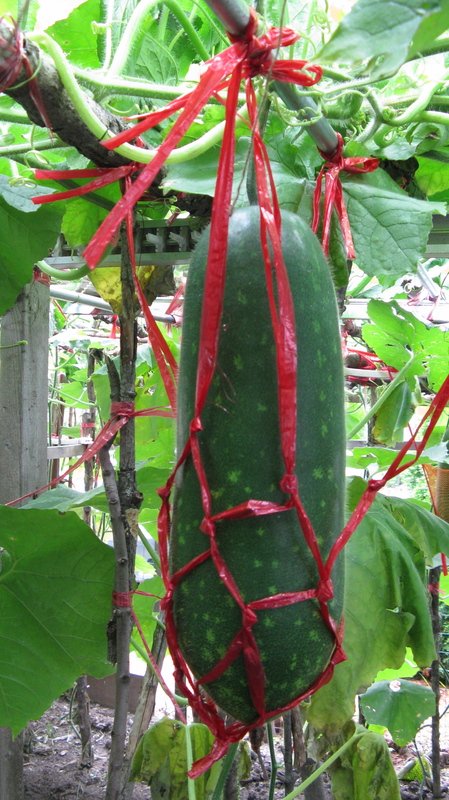 Later, she plants a winter melon seedling at the base of each branch. As they grow, the unfurling tendrils twirl themselves around the branch base. They climb up to the roof branch and crawl across. 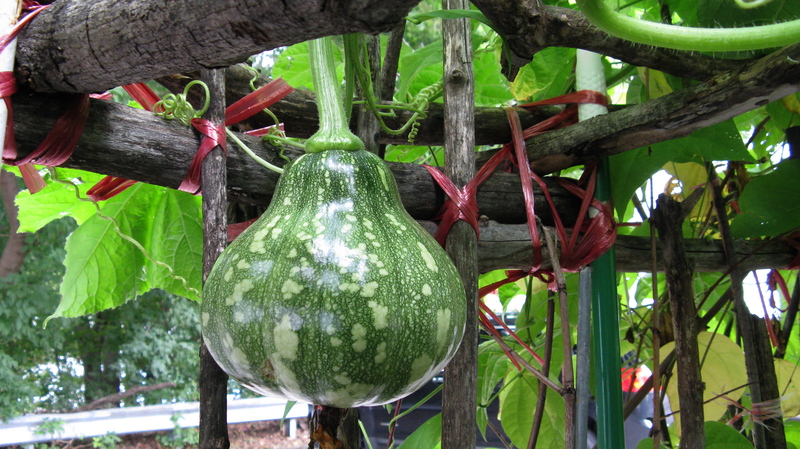 Each vine produces many melons that are eaten when small in July and August leaving one melon per vine for maximum growth. 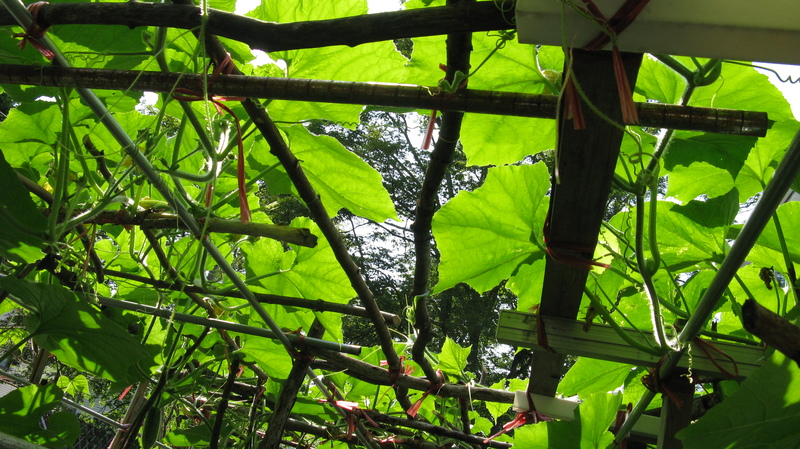 As the melons grow heavy, Yan wraps them in twine and suspends them from the roof branches so they don’t detach from the weight and fall from the vine. About 30 or 40 are harvested when it snows, and then they are stored and eaten throughout the winter. They grow to about two feet. The melon has a dark green skin and is white inside and used for soups and stir-fry along with the stems and flowers. 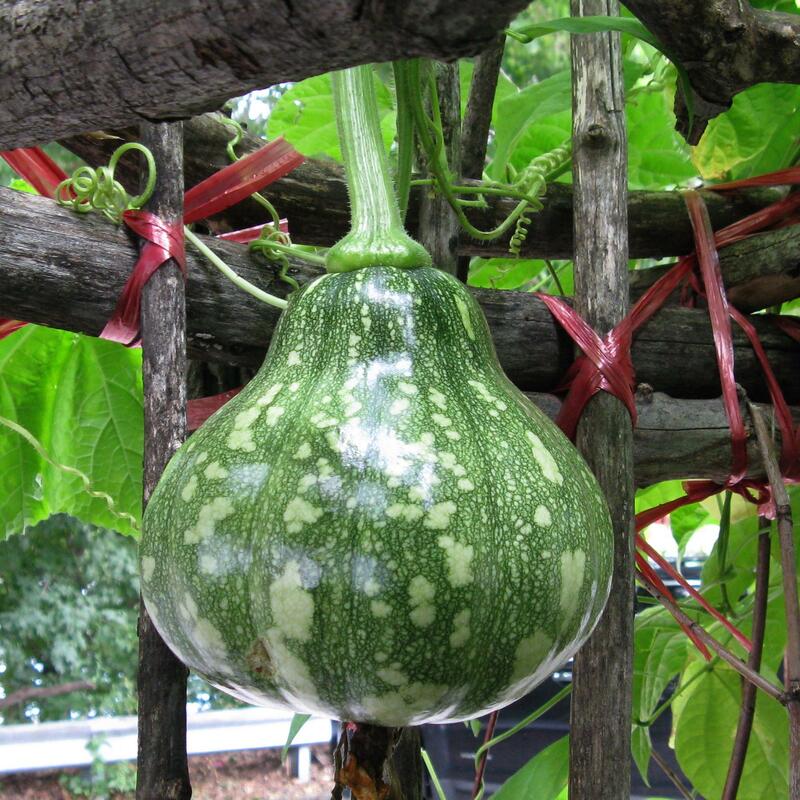 Chinese pumpkin or nan gua have a Halloween pumpkin shape and size, are dark green outside and orange inside. It too, is harvested late and eaten all winter. At the end of April she begins picking goji berry leaves. Because goji berries are readily available she grows the early spring shoots for their tender leaves. They are stir fried with eggs and also used with chicken broth with pork or chicken bones. It is also cooked with liver as a treatment for the eyes. 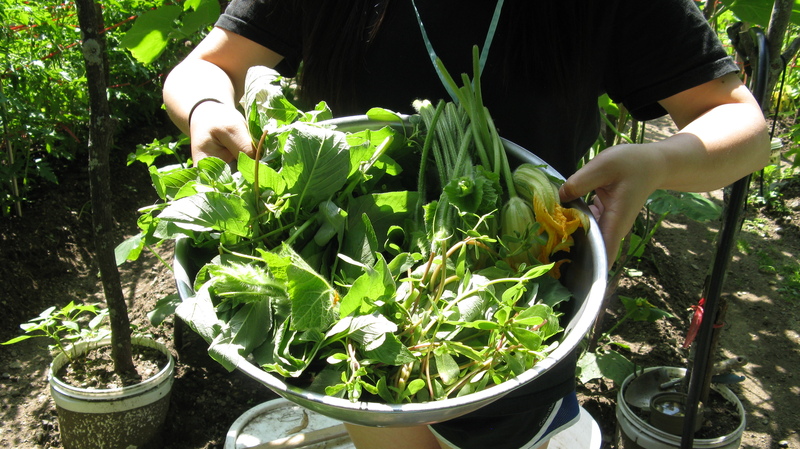 June begins the picking of “mah see han” (from southern China) that’s used in soup and stir fry. It has yin properties that Maggie says brings down internal fire. As children she and her siblings were showered with and drank the broth of water infused with “mah see han” as a treatment for chicken pox. The same treatment was used when one of the babies in their family suffered from dermatitis. It is grown in two concentric circles, the inner circle is left to go to seed for sowing next year the outer for eating throughout the season. 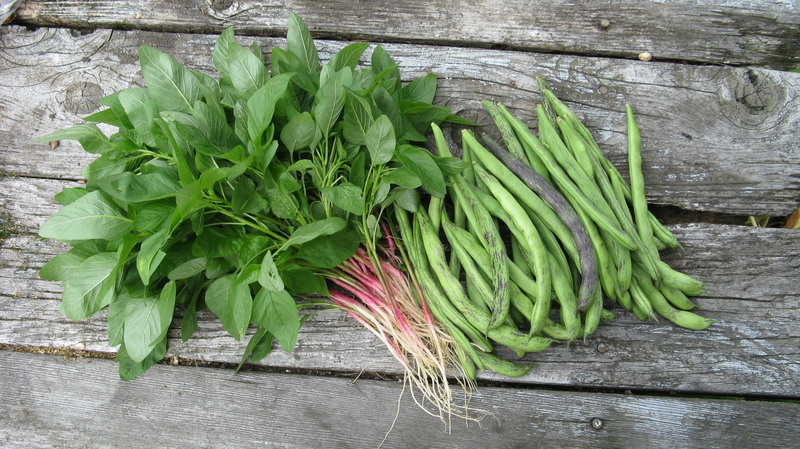 Later, in July four-season beans and sweet potato leaves are used for stir-fry, the beans, for soup. They are larger and flatter than string beans and the whole pod is used. Soon I will plant the goji berry twigs and taste the ma see han greens that they so generously gave me. I’m very grateful to Maggie and Yan for sharing their vast knowledge and love of plants with me. I have learned so much about plants I’ve never before seen or tasted. An experience I will not forget. Fascinating view into a Chinese vegetable garden! I want to come for dinner. What a great story and beautiful garden, very informative! Great work Liz.